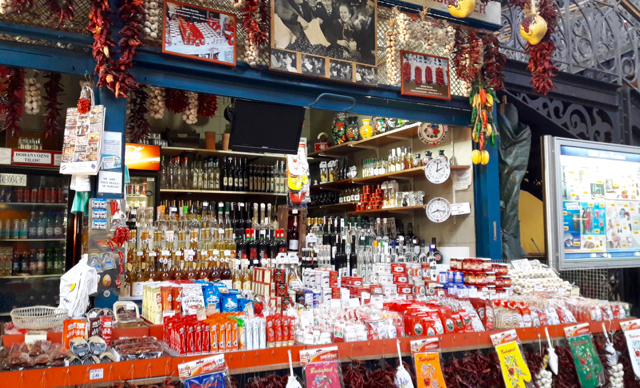 Paprika is considered as the national spice of Hungary, and therefore it’s one of the most common items for sale in the Budapest Market Halls. 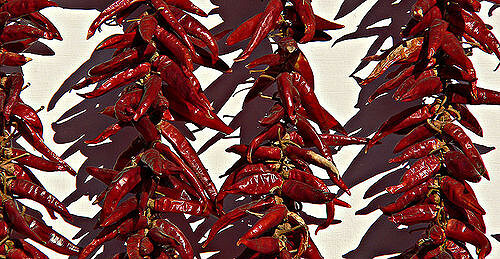 It is a powder made from dried, deep red paprika pods of various kinds of Capsicum annuum peppers. Since the plant arrived in Hungary in the 16-17th centuries, Paprika became the symbol of Hungary’s cuisine and is an essential component of the everyday dishes like Porkolt (stew), Goulash, Chicken Paprikás, and Halászlé (fisherman’s soup). 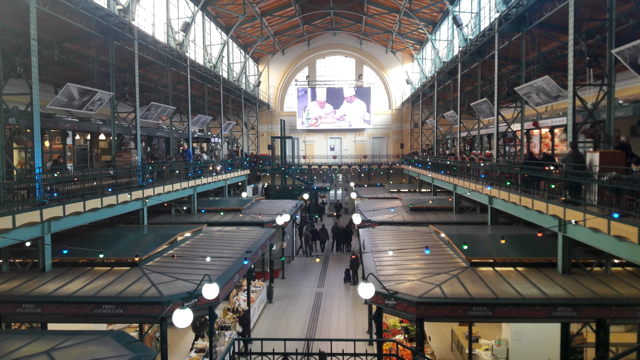 If you fancy tasting the real Hungarian Goulash soup, we recommend to book a Guided Market Hall Tour, where your dream can come true! The color of the spice varies from mild to bright red and even brownish color, depending on the type of pepper. Due to the climate, and geographical conditions Hungarian paprika has a bright color and unique rich flavor that allowed Hungary to become one of the leading producers in the world. 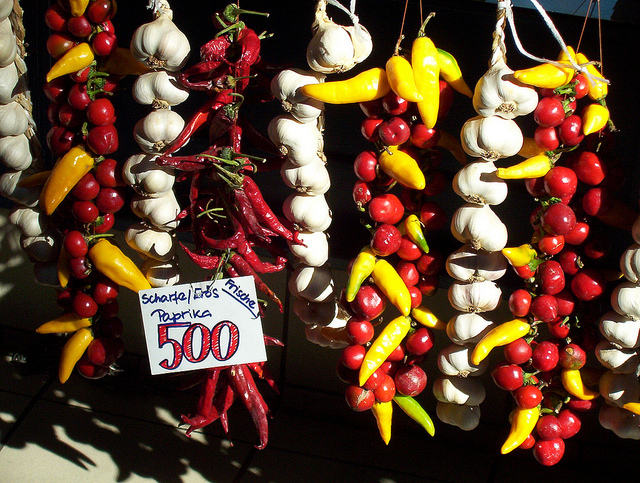 Kalocsa and Szeged are the capitals of Paprika production in Hungary. These south regions have the highest amount of sunny hours a year, and the plants need lots of sunshine to get ripe and sweet. Ripe peppers are harvested in September. The surrounding towns and villages are organizing Paprika Festivals and Fairs to celebrate the Harvesting period, with music, dance and delicious paprika meals. The Paprika harvesting villages are adorned with fresh, threaded paprika strings, hung from porches and gates. Kalocsai and Szegedi Paprika are listed Hungaricums. (Hungaricums are special items from Hungary, that characterize the Hungarians by their uniqueness and high quality). 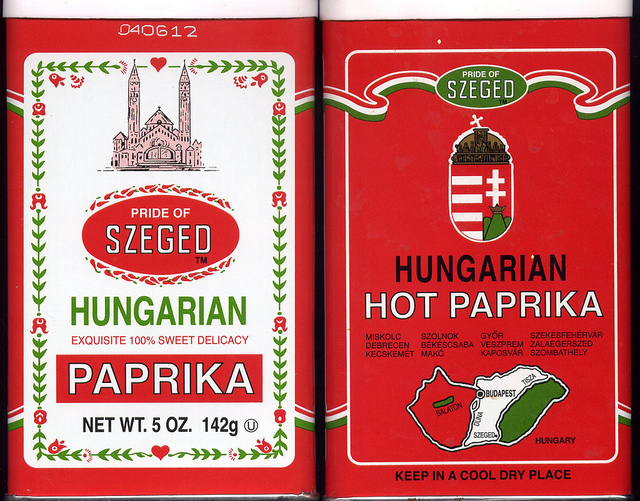 Related: Which Is The Best Hungarian Paprika And Why? “There is something about paprika itself that makes it synonymous with ‘Hungarian.’ ‘Fiery,’ ‘spicy,’ ‘temperamental’—all these adjectives suggest both paprika and the national character,” writes George Lang in The Cuisine of Hungary. 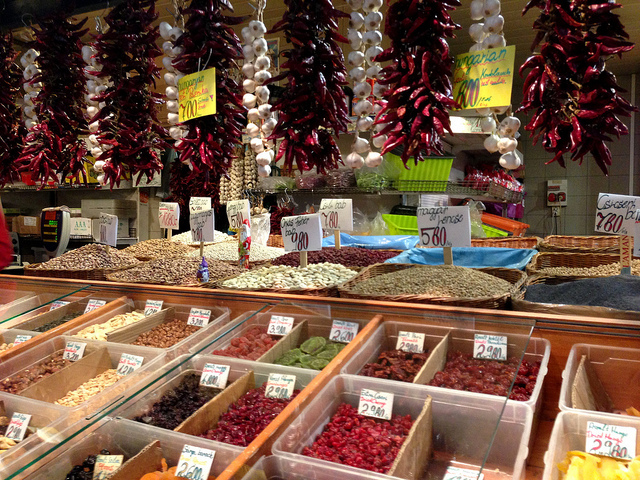 Hungarians love paprika, it fits almost every traditional meal. A true classic of the Hungarian kitchen is Piros Arany (Red Gold) which is a mild or hot paprika paste with vibrant crimson color. It is ready to eat with sandwiches or cold plates but it gives a nice paprika taste to cooked meals too. Piros Arany is a popular product on the domestic market since 1963. The second most popular paprika paste on the Hungarian Market after Red Gold. It is sold in small jars and can be added to any paprikash style meals or sandwiches. Erős Pista is hot the pair of Édes Anna, it is also crushed paprika paste but the main ingredient is hot paprika. It is used in spicy Goulash or Fisherman’s soup but it fits to almost every hot dish. The four pillars of Hungarian spicy meals are the famous gulyas, and porkolt, the stewy paprikas and tokany. 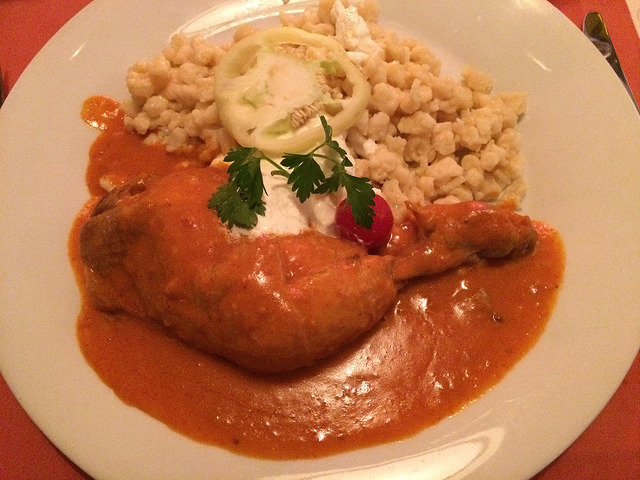 Paprikás csirke (pronounced paprikash cheerke) or Chicken Paprikash is a classic meal around the country. 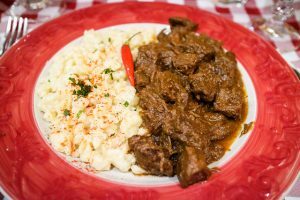 In Hungary, this dish is usually eaten with Galuska (spaetzle, Hungarian mini dumplings), and a Cucumber Salad or Pickles, but it tastes good with pasta or rice too. It is very simple to make, you will need only a few ingredients: chicken drumsticks and thighs, onions, flour – all-purpose, goose fat or cooking oil, sour cream, salt, pepper and of course paprika. You can also add some tomatoes and peppers if you like. Using the basic Paprikash Method can be applied to any other meat, fish or mushrooms. Heat the lard (or oil) in the pot, add the 1 or 2 chopped onions, and stir them until the onions are glossy (Use 2 small onions for 500 g of meat and 3 or 4pcs for 1000 gr of meat). Remove the pot from the heat and add the grounded paprika (so the paprika doesn’t burn and become bitter). You can add some chopped tomatoes too (1 or 1 pcs). Place the chicken pieces in the pot and add salt, pepper and a bit of water. Cover the pot, and cook for about 30-45 minutes in medium/ low heat. If the Paprikas is too juicy, remove the lid. When the meat is cooked mix the sour cream and flour in a bowl (you can add some cream too). 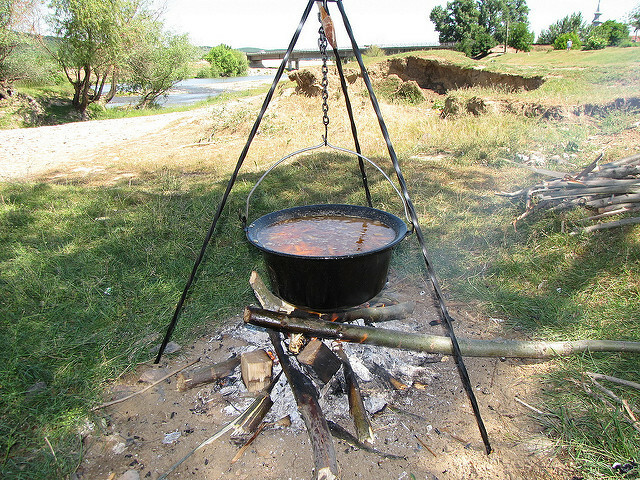 Fisherman’s soup or ‘Halászlé’ is a paprika-based river fish soup, with paprika (often hot). The soup was originally prepared by fishermen along the rivers, using fresh caught fish, most often carp, pike, catfish, and perch, (ideally, a mix of all four, give the soup more flavor). It tastes the best prepared in ‘Bogracs’ (kettle above open fire) as it has a bit smoky taste as well. Fisherman’s soup is a traditional Christmas Eve dinner but also eaten in the summer or in any fishing season. There are ‘Halászlé’ Festivals around the country in the summer months. Following the Hungarian proverb “as many houses, as many customs”, this meal exists in many versions. In the Danube region, in Baja and the surrounding areas Fisherman’s soup is served with handmade noodles and never mashed onions and fish pieces, but in the Tisza region and in Szeged the soup is served with fresh bread and some of the fish pieces and onions are mashed in the soup to give a rich texture. The meal was originally prepared by the herdmen in Puszta in hanging cauldrons, over open fires. Nowadays it is a popular meal in the country and we recommend you try it in Budapest! 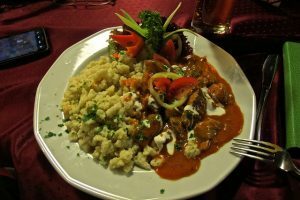 Read more about Goulash and find a lovely recipe here. Fancy to taste Hungarian Meals? Join us at one of the Tasting Tours in Budapest. The Paprikash method was already common in the 17th century. Porkolt became from herdmans meal to one of Hungary’s national dishes. Paprikas meals are still popular in weddings and weekend lunches. There is no Sunday without Porkolt– said a speech from Csongrad shire. 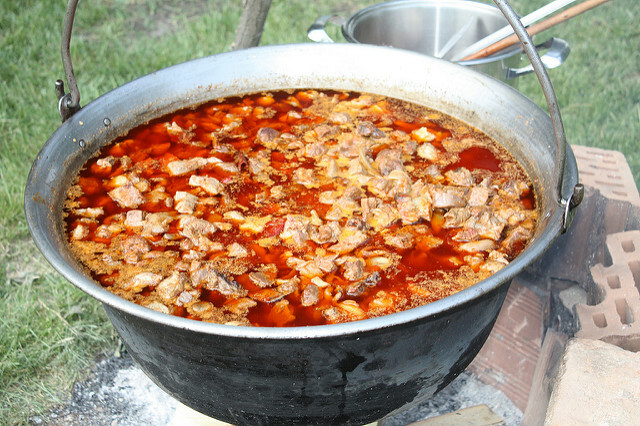 Porkolt is similar to Gulyas, but it is thicker like a stew as the meat is cooked with less water. It is common to enrich the stew with peppers and tomatoes. Porkolt is usually served with Nokedli (Hungarian mini dumplings), noodles or rice. To make the porkolt, sauté the onion in the oil until golden. Remove from the heat and add the paprika (removing from the heat ensures the colour and flavour is released without burning). Stir for a minute then add the meat. Make sure that the meat is covered with the onion-paprika mixture. Now we can add the water. Simmer until slightly reduced. Add the salt, garlic and paprika paste and stir well. Simmer until the meat is tender. There are thousands of different Sausage (Kolbasz in Hungarian) varieties in Hungary. One ingredient is common in all Hungarian sausages, it is the Paprika. 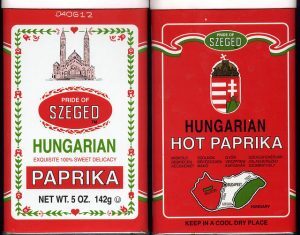 No true Hungarian salami or sausage exists without authentic, Hungarian red, grounded paprika. We can find smoked or fresh sausages. Fresh Sausage for Baking (Sütő kolbász, Sütnivaló kolbász) is a traditional “Street food” in Hungary. Served with fresh bread, mustard and pickles, it is a hearty meal. Thy it at one of the tasting tours. Dried and/ or Smoked Sausages are available to buy and they make a lovely present from Hungary. 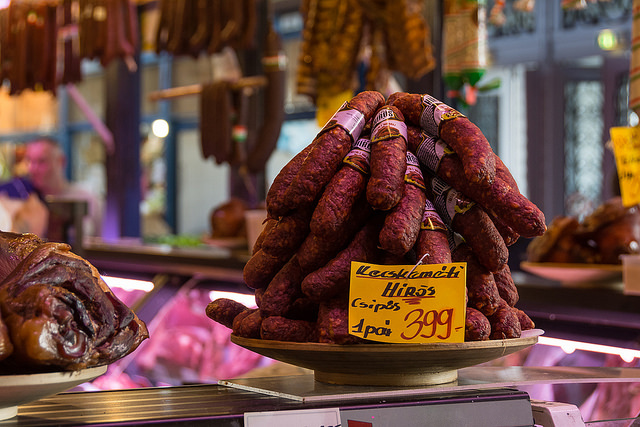 Interested to read more about the tasty paprika sausages and salamis? Click here. do u have the sweet bread along with the prune and nut cookies with powdered sugar?